I've always threaded the lesser traveled paths because I am too fat and won't fit in the path crowded with people. Almost everyone in my family were and are teachers. I became a writer. Almost everyone in my family live and die as employees. I quit a lucrative job to be a freelancer. I'm okay with it. I'm okay with the "unconventional route" especially because in that world outside my family, the route I have taken is not that unconventional. But I know my parents are worried that I have no regular job and that I am still single. I know they are worried that I will grow old alone. The only thing I am worried about is them, that they worry to much about me. I'm fine. I've got it all figured out... most of the time. You know how all kids are naturally adorable, right? Well, I was probably a freak of nature because I wasn't. My relatives in my father side particularly resented my presence. I don't know why. I was probably an irritating kid who did all sorts of irritating things and had a naturally irritating aura. I remember one time when we went to my cousin's new place as they were moving in, we had lunch and I ended up sitting by the food. The next day, my mother told me that someone told her I kept on helping myself with servings that chicken even though I still had some on my plate. I was fat, still am fat, but for heaven's sake I eat more rice. Give me a piece of chicken leg and I'll eat a bowl of rice. It's against my character! It would have been more believable if they said I kept on helping myself with more rice, guddamit. Unconsciously, I used all those hate to motivate me to succeed. 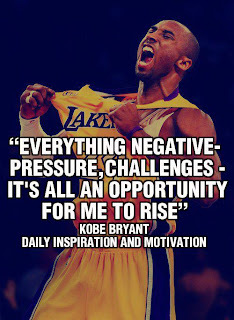 Hence, the Kobe Bryant poster. Here are some new opportunities for writers. I know that many of my readers are home-based freelancers or run a home-based business. I also know that many of you are writers. literary fictioncrime fiction ‘Norfolk gothic’Just be mindful that they are primarily marketing to the UK market. 1. If you learn that your friend is being cheated on, are you supposed to tell her or him or stay out of it? If I am to put myself in the my friends position, I would want him or her to tell me but then, I also can't expect her to get involved in my issues especially if both of them are my friends. 2. How are you supposed to tell your friend he or she has body odor? 3. Why do people cheat? (context: relationship) If you are really in love with the new person, why put her in a situation where she will become a mistress? If you are in love with the original, then why hurt her? 4. Is it really better to not know? And so dinner went on and she went on. Right about the time when I was starting to recover from the "beauty is more important than food" part, she started talking again. She called me by my name. I was impressed considering, no one told her my name. She must have a link to the FBI or something. I stopped chewing and looked at her. It was a monumental part of my life, the girl with 7,000 pairs of shoes just called my name. No one with 7,000 pairs of shoes ever called my name. "You know," she said. "I don't believe in those people who keep on leaning to the left." My elementary school screwed me bad. My high school screwed me worse. My teachers in elementary made fun of me a lot because I was the fattest in school. They also never taught my school mates that people should look beyond someone's size. I guess it was because I was so fat, they literally couldn't look beyond me. That's not all, they never made me love learning. I never saw nor felt how wonderful it is to learn and discover new things. When I was in high school, a teacher and several classmates spread the rumor I was lesbian. All my friends stopped being my friend... literally. It lasted for several months. Don't worry, all is forgiven now. 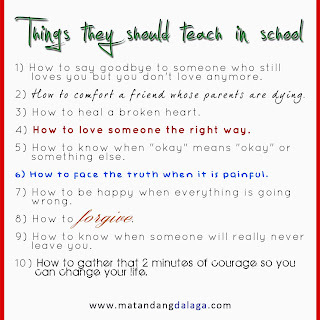 But there more important things which I wish they taught us. 1) How to say goodbye to someone who still loves you but you don't love anymore. 2) How to tell your friend the person he is in love with is the wrong person for him and you're the better person. I like weird people so when I had the chance to have dinner with the former first lady, Imelda Marcos, I was excited. Aside from the fact that I find her extremely beautiful, I have also heard of her eccentricities and I wanted to experience exactly how eccentric she was. We had dinner at Manila Pen. I can't say what it was about. If I say it, I will have to kill you. She was quiet in the beginning but right after the main course was served she started talking. She started with a warm up, calling us all by our first name which was impressive considering we were introduced only once. She asked us about our food and work before proceeding to what she really wanted. She said, "You know what's more important than food?" My last relationship was a long distance one. We stayed together for a year. It was alright. I have always been a low maintenance type of girl so if there was anyone who could make it work, it was me. It just that he wasn't the right guy. Is Facebook making people classless? He was supposed to come home in time for our fist anniversary. Right before that, we had some issues, a major one... the first major one. Several days before his return, he stopped talking with me. The next time we talked, he said he is not coming home. That was the last time we talked. Apparently, we broke up. I guess he didn't feel the need to tell me. About women changing their last names. And this is what people have come down to... posting angry messages on Facebook that's obviously directed at someone but is made to appear as if it is a generic post. Do they actually think that the people for whom the message is written won't figure out it is for them? And what are they planning to do? Deny that it's for them? This is how cheap we have become? We can't tell someone we are angry towards them so we tell the whole world instead? It's cheap and it's classless. If you can't say it in the person's face, then don't post it on your facebook wall. 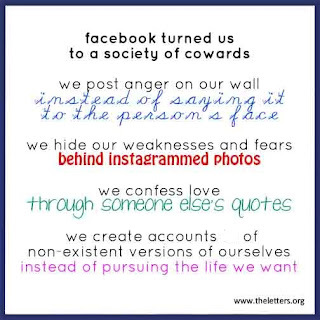 This is what people have come down to... posting the most personal, intimate things in our life with so much detail and expect not to be judged for it? Are you a special kind of stupid?